Foam rollers have become popular in the fitness industry as device used to assist with self-stretching and soft tissue mobilization. Foam rollers can be purchased for a reasonable price online or in most sporting goods stores, and are often present at gyms and fitness centers. 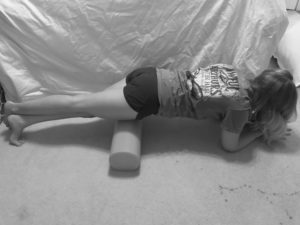 Foam rolling, if performed appropriately, can be a simple technique to get “feel good” results. Foam rollers are used to help improve soft tissue mobility and promote blood flow to the target area. Though these benefits are short term, foam rollers can increase flexibility and range of motion and may decrease fatigue and/or muscle soreness that often follows exercise. 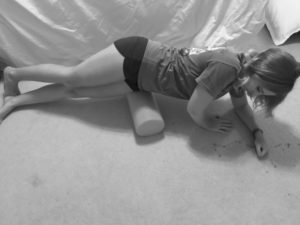 Avoid foam rolling over bony areas, areas of bruising, or wounds. Be cautious about excessive rolling over an area diagnosed with an inflammatory condition (i.e. bursitis, iliotibial band friction syndrome) because repetitive rolling may exacerbate the condition. When treating these conditions, it is more beneficial to treat the surrounding soft tissues. How to? How Much? When? 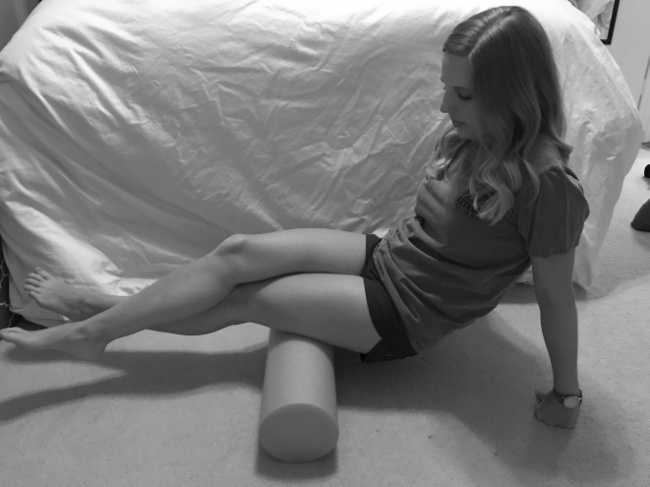 Use a roam roll primarily over areas of MUSCLE – specifically tight or tender spots. 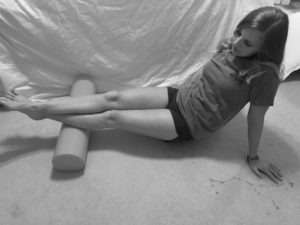 Images below illustrate common applications of foam rolling on different muscle groups. Begin by gently rolling over the full length of the muscle. When you find a tight area, stay there and sustain the pressure of body weight over the foam roller for 30-60 seconds. If unable to find a tight or tender spot, perform 20 slow rolls each direction along the muscle belly. Research has not concluded whether foam rolling before or after exercise is best and neither has shown to be detrimental to performance SO do what works best for you and your routine! 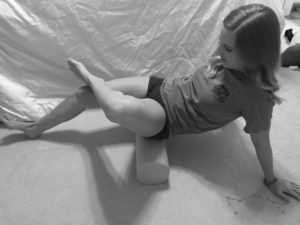 To roll the gluteaus maximus (buttuck), position yourself on the foam roll as shown in figure A and lean back on your hands. To roll the gluteus medius (Figure B), rotate into a slide lying position over the foam roll with hips tilted slightly backwards. To roll the TFL (Figure C), you will need to rotate your hips forward. Piriformis (Figure D): While seated on the foam roll, cross one leg so that your ankle is on the opposite knee. Roll the hip on the side of the bent knee. Quadriceps and Hip Flexors (Figure E) While lying face down, place the foam roller under the front of your thigh. Begin rolling below the bony prominence at the front of your hip to just above your kneecap. Rolling closer to the hip will access more hip flexor while closer to the knee will be more quadriceps. This may also be performed with knees bent to touch the floor. Hamstrings (Biceps Femoris, Semimembranosus, Semitendinosus) (Figure F) While seated on the floor with foam roll underneath the back of your thigh, roll from below your glutes to above your knee. Calves (Gastroc & Soleus) (Figure G) While seated on the floor with the roll underneath the back of your lower legs, cross one ankle over the other and roll from below the knee to above the ankle. This can be continued with bottom leg rotated varying degrees to access both the inside and outside of the calf muscles.